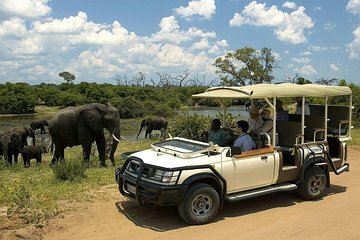 Combine a Chobe National Park day tour with another fun activity and save big! The day tour is the perfect way to see some of the most sought-after animals in southern Africa on a river cruise and game drive. Then choose from White Water Rafting or canoeing, ‘Big 5’ Night Drive & Dinner, Adrenaline High wire Package, 13-minute Helicopter Flight, or Horseback Riding to create your own adventure package. Visas may be required for this tour (for guests own account). Chobe National Park entrance fee not included. Please note: *Additional Activity Excludes National Parks and Visa fees.